We went to an Opening Ceremonies viewing party at my parents house last week and I volunteered to bring a themed dessert. 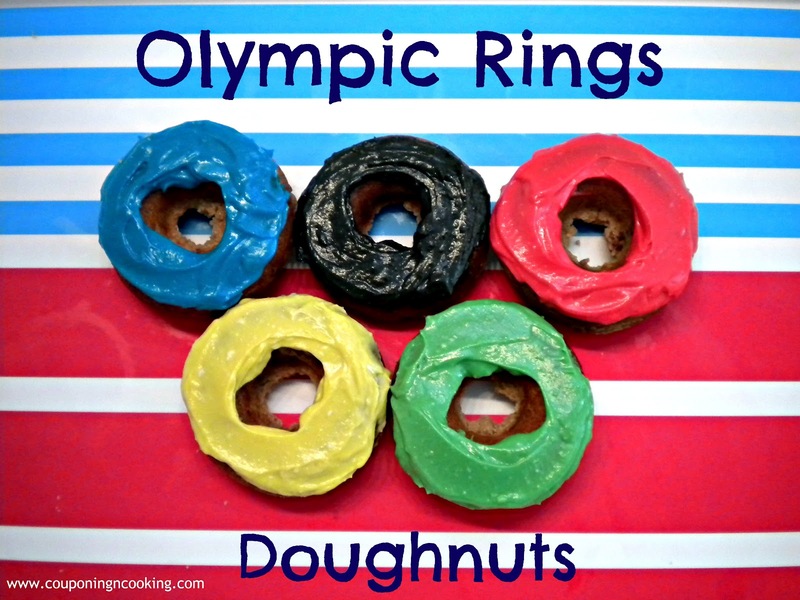 I was going to make one of my favorite American desserts but instead I got lazy and decided to go with something super easy but still super cute, Olympic Rings Donuts. I had all kinds of ideas for trying out new doughnut recipes but in the end I went with something ridiculously simple that I already had on hand. I used Cinnamon Streusel Muffin Mix and poured it into my Wilton Doughnut Pan and baked them in the oven. I then used my favorite Brown Sugar Cream Cheese Icing (because what goes better with cinnamon than cream cheese?) and mixed up the five colors of the Olympic rings. Embarrassingly easy. The rings would have probably looked cleaner/smoother if I had used a royal icing or glaze that would have dried smooth but since I usually go for taste over cuteness, I went with the cream cheese. They were a big hit at the Opening Ceremonies party and the best part is you can make them out of any boxed muffin mix you have at home and with any light colored icing you prefer. You could even go with store bought icing to make your life even easier. Go Team USA! Those look so yummy! And so fun for an Olympic party! I think they look perfectly edible - how clever and easy! Thanks for sharing at the Creative Corner Blog Hop. Such a fun idea! I am loving the Olympics! I just love doughnuts.........sigh........ Thanks for linking up! This is so clever and now I wish I had a doughnut pan. They are adorable. Thanks for sharing them in the Recipe Box. I can hear the Olympic theme music playing now! How fun! I need a pan like that! Thanks so much for linking up to our Pinteresting Party! I love how simple it is to make donuts from a muffin mix!!! These are so cute! Go team USA!!! This is super cute! Thanks for sharing on Marvelous Mondays! Cute idea -- so is an Olympic themed get together! Thanks for sharing on Busy Monday! FUN FUN FUN!!! I want to eat a couple right now! How fun. And one more example of why I NEED a donut baking pan! Thanks for sharing on Tout It Tuesday. Hope to see you tomorrow. Check your karnataka sslc result here available. RRB Admit Card 2018: RRB will upload the RRB Group D & ALP admit card (hall ticket) on the official website of RRBs. Railway Board will be released RRB admit card from May 2018 (tentative).